One of the perks to having a smaller home with limited storage is that you have to switch out the clothes in your closet every season. This might not sound like a perk to many of you, and honestly, I didn't for me either initially, but it has proven to be a wonderful thing. For one, it makes me reevaluate everything I own every few months. I have to figure out what I really want to keep, what I don't wear and what I don't need, thus eliminating a lot of things that were just taking up space before and that can better serve someone else. It also helps me remember what I have. When you have a closet big enough to allow you to keep piling things in it, things get pushed to the back and forgotten about. Not so with my clothes. Another great thing about changing out your closet each season is that it keeps you organized. Because there is a complete overhaul four times a year, four times a year everything gets nicely repositioned and reorganized. It also allows you reevaluate your current organization system and change up things that aren't working and build off things that are, making my closet more efficient every time. No, this isn't my closet (a girl can dream), but it is a great example of how beautiful and organized a closet can be. Even if your closet is big enough for you to keep all of your seasons together, you should still go through and declutter it at least every 6 months. 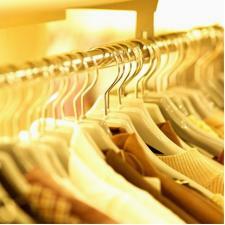 Putting it off any longer will only make the task more daunting and your closet more chaotic. Here are a few tips to get you started. Purge It-There's nothing better you can do your closet than to get rid of the things in it that you don't need. When going through your pieces don't ask yourself "Can I still fit into this?" Instead, ask yourself "Would I choose to wear this over other things in my closet?" If the answer is no, it's time to say goodbye. Make a little extra money for the holidays by selling it on eBay or donate it to someone in need. Don't forget to donate all of your unused hangers too. Thrift stores are always in need of these. Organize It- Once you've decided on what things you want to keep, place similar items together. Group your short sleeve shirts together, your long sleeve shirts together, dress pants together, etc. This will help you see what areas you need to expand your wardrobe and will also help you easily find what you're looking for. Code It- Color code each group. Again, this will help you locate items quickly and will give you a better sense of what's in your wardrobe. You'll never know you have seven black, long sleeve tops until they are all grouped together. Hang It- Invest in some good hangers. I have a fondness for felt hangers for a number of reasons. Your shirts don't slip off of them. They are thinner than the bulky plastic hangers, freeing up more space in your closet. They have perfectly rounded edges so your clothes don't get what my sister and I call "pokey holes" at the shoulders. And best of all these are sold everywhere now, even at Ross and TJ Maxx! To help your pocketbook, buy a few packs at a time and gradually make the change. Eventually you'll have a streamlined closet full of matching hangers. Box It- I'm not a fan of putting my shoes in boxes because I think it takes up too much room, but if that's your thing, make sure you know what's inside. Purchase some clear plastic shoe boxes to house all of your shoes. If you don't want to spend that much, you can keep the original boxes and label them so you don't have to pull a Jenga move every time you're looking for a shoe. Another idea is to get out your camera and takes shots of each pair to hang out the outside of each box so you know exactly what's inside. Sweat It- Fold up your sweaters and organize them on a shelf by color. Hanging sweaters will alter and ultimately ruin their shape over time. Plus you'll free up a lot of space by removing those bulky wools from your hanging bar. Enjoy it!- When you're all done, you should feel proud and happy. Enjoy your newly organized wardrobe, and the ease of "shopping" in your closet it will bring you.